Download Catalog #49 PDF: Click to download (requires Adobe Acrobat Reader). Printable in B&W or color! 1905 Waterman #58 LF in Cardinal. GFT. Medium, triple-flexible nib. Far, far better condition than almost always found, with no cracks, gouges, etc. Deep imprints on both the side and bottom of the barrel. A little color change on the barrel where hidden by the cap, and a cap posting mark near the bottom of the barrel, otherwise near mint. 1935 Soennecken Prasident #1 BF in Black Hard Rubber. Rare, first year model, with the bulbous cap! GFT. Medium/broad nib. Near mint. 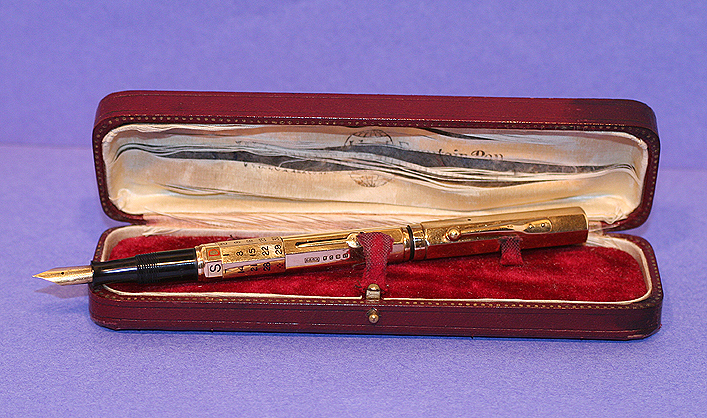 1920 Waterman 552 ½ LF in 18K Solid Gold. 7-sided pen, sporting a perpetual calendar with days of the week in French. Besides the Waterman signatures and hallmarks, the pen is marked “Mappin & Webb London.” telling us that the pen was made to be sold by this famous retailer of jewelry and silverware, founded in 1774. New-old-stock. Mint in original red velvet lined, hinged red leather case inside of top is a bit threadbare). Click for photo of pen in box. 1970 Montblanc 149 PIF Demonstrator in Clear Acrylic with black turning knob and inner cap. Extremely rare!!! GFT. Medium nib. New0old-stock. Mint. 1946 Montblanc 139 PIF in Black. GFT with the two outer cap bands in Sterling Silver. Medium/fine, flexible nib. Just a tad of wear to the lines in the visualated barrel, otherwise near mint. 1937 Waterman #594 LF in 14K Solid Gold. Extremely rare! Medium, extra-flexible nib. A few minor dings, otherwise near mint. 1928 Waterman #454 LF in Sterling Silver over BHR. “Night & Day” pattern. Fine, triple-flexible nib. New-old-stock. Except for a little oxidation, mint. 1911 Waterman #16 eyedropper-fill in Red Mottled Hard Rubber. NP Clip. Fine, triple-flexible nib. A little oxidation of the rubber, otherwise near mint. A perfect, deep barrel imprint and the “16″ on the bottom of the barrel still has it’s red highlighting! 1914 Waterman #552 ½ LF in BHR with 14K Solid GREEN Gold “Smooth” overlay. A handful of minor dings here and there. Medium nib. 1915 Waterman #15 POC eyedropper-fill in BCHR. Absolutely mint, with beautiful crisp deep imprints and perfect black color! Extra-fine, flexible nib. 1915 Waterman 452 ½ Long Extended Case LF in Sterling Silver on BHR. “Hand Engraved Vine” pattern. Original patina – not polished (will do so on request). Fine point. Near mint. 1917 Waterman #42 Continental Octagonal Safety eyedropper-fill in 18K RG (gold-filled). Alternating panels of pinstripe & geometric designs formed within very fine pinstriping. The middle1/2″ is White RG Barley. Matching cap. Repousse crown and clip. Fine, triple-flexible nib. Unrestored. 1917 Waterman #42 ½ Continental Octagonal Safety ring-top eyedropper-fill in 18K RG (gold-filled). “Chicken wire” design formed within fine engine-turned pinstriping. Matching cap. Near mint. 1918 Waterman #412 ½ V(S) “Baby” eyedropper-fill in Sterling Silver over BHR. “Filigree” pattern. Original patina – not polished (will do so on request). Fine, extra-flexible nib. Near mint. 1928 Waterman #454 LF in Sterling Silver Overlay “Night & Day.” Fine extra-flexible italic nib. The long panels in the overlay are pinstriped. Has a replacement Waterman clip which is not sterling silver, otherwise near mint. 1928 Waterman #52 ½ LF in Cardinal Hard Rubber. GFT. Very rare, especially with no cracks and only minimum wear! Medium, flexible nib. Some brassing to the clip ball and a little wear to the imprint on the bottom of the barrel, otherwise near mint. The imprint on the side of the barrel is deep and crisp. 1928 Waterman #94 LF in Blue-Green Ripple (Rare). GFT. Medium, flexible “Red” Keyhole nib. Canadian manufacture. One surface scratch under barrel imprint noticeable only with a loop, otherwise near mint+. 1925 Waterman #52 LF in Red Ripple. GFT. Fine, extra-flexible nib. Near mint. 1926 Waterman #5 LF in Red Ripple. “Grey” band on cap and “Grey” signed broad, oblique nib. Very rare! GFT. Near mint. 1926 Waterman #5 LF in Red Ripple. “Red” band on cap and “Red” signed medium, flexible nib (with an italic flair). GFT. New-old-stock. Mint. 1926 Waterman #5 LF in Red Ripple. “Purple” band on cap and “Purple” signed fine nib. GFT. New-old-stock. Mint. 1927 Waterman #7 LF in Red Ripple. “Pink” band on cap and “Pink” signed fine, triple-flexible nib. GFT. Near mint. 1927 Waterman #7 LF in Red Ripple. “Red” band on cap and “Red” signed medium, flexible nib (with an italic flair). GFT. Near mint. 1927 Waterman #7 LF in Red Ripple. “Purple” band on cap and “Purple” signed fine nib. GFT. A little imprint wear (fully readable) otherwise near mint. 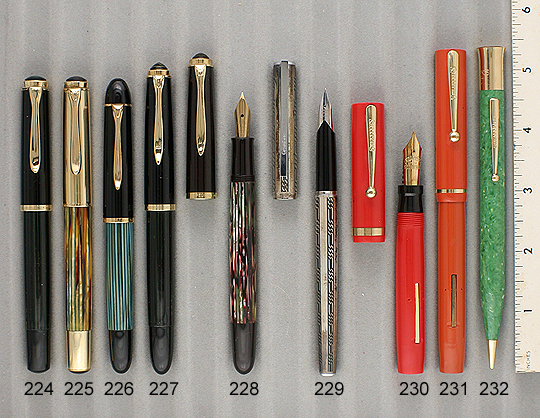 1931 Waterman #92 LF Set in Red & Bronze (beautiful!). GFT. Medium, flexible nib. A tad of brassing here and there, otherwise near mint. 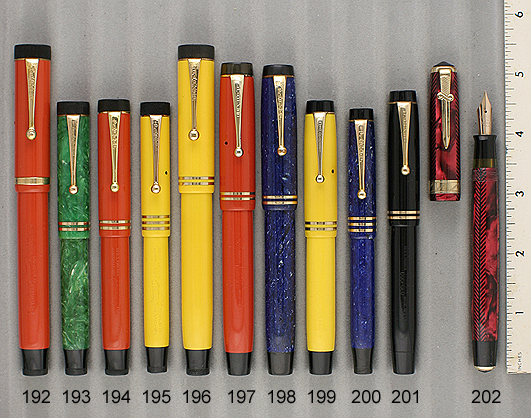 1931 Waterman Pencil for above set. 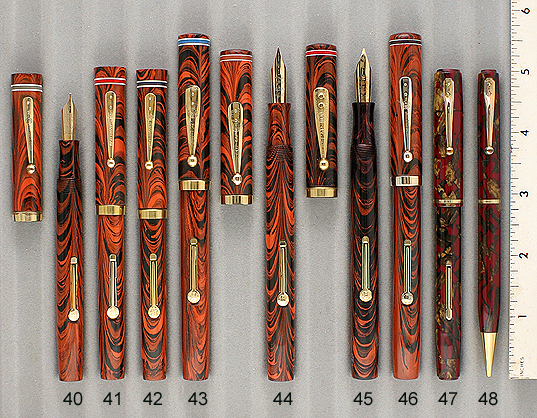 1931 Waterman #92V LF in Red & Bronze. GFT. Extra-fine nib, with a tad of flex. A little brassing on the bottom edge of the cap band, otherwise near mint. 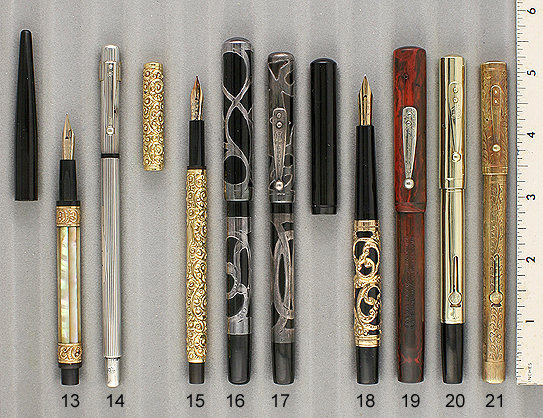 1932 Waterman #3 LF in Silver & Bronze Pearl. NPT. Fine, flexible nib. A tad of brassing, otherwise near mint. 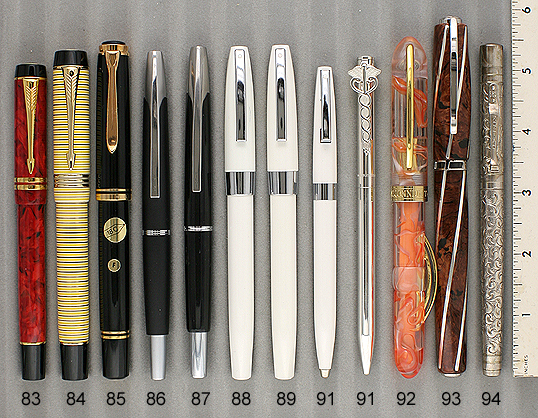 1933 Waterman #3V LF in Silver & Bronze Pearl. NPT. Fine, triple-flexible nib. A tad of brassing, otherwise near mint. 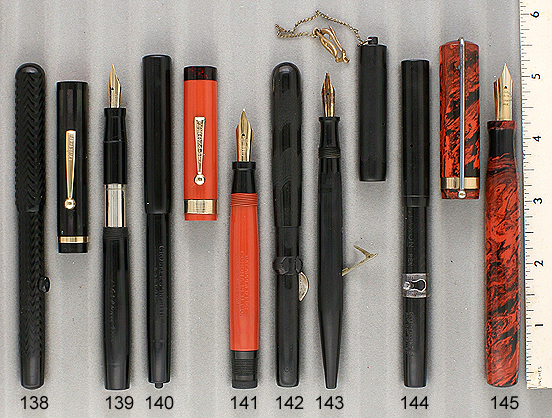 1939 Waterman 100 Year Set in Red. GFT. First year model, with over-the-top “Military” clip. Fine, extra-flexible nib. New-old-stock. Mint. 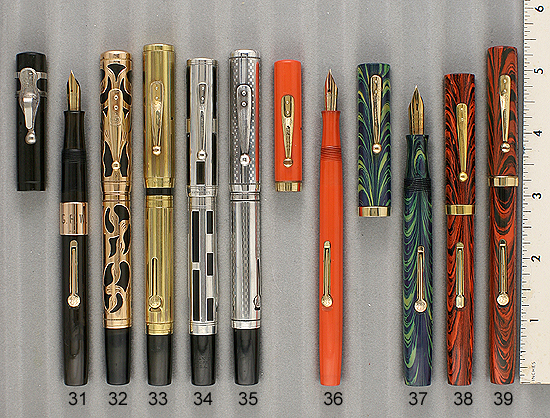 1939 Waterman Pencil for above set. 1939 Waterman 100 Year Set in Blue. GFT. First year model, with over-the-top “Military” clip. Fine, flexible nib.New-old-stock. Mint. 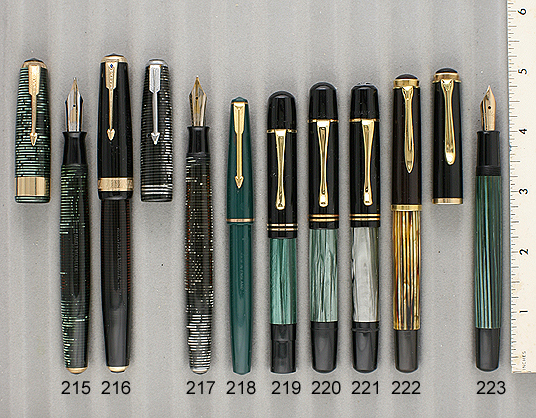 1939 Waterman 100 Year Set in Green. GFT. First year model, with over-the-top “Military” clip. Fine, extra-flexible nib. New-old-stock. Mint. 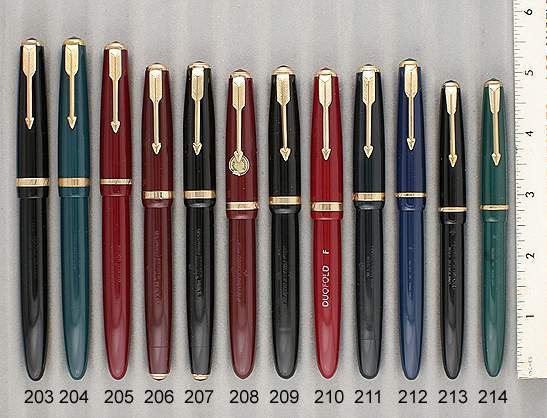 1941 Waterman 100 Year Standard Set in Maroon. GFT. Fine, triple-flexible nib. New-old-stock. Mint. 1941 Waterman Pencil for above set. 1935 Waterman Ink View Standard in Black. CPT. Wonderful Art Deco design with visualated barrel. 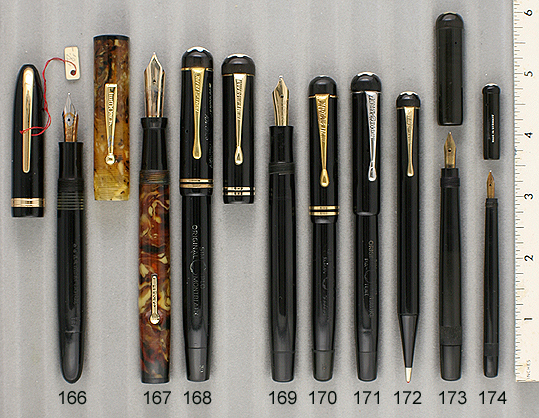 This was Waterman’s answer to the Parker Vacumatic! Medium/fine, extra-flexible nib. Near mint. 1941 Waterman #2 LF in Red Pearl (rare). NPT. Medium nib. Near mint. 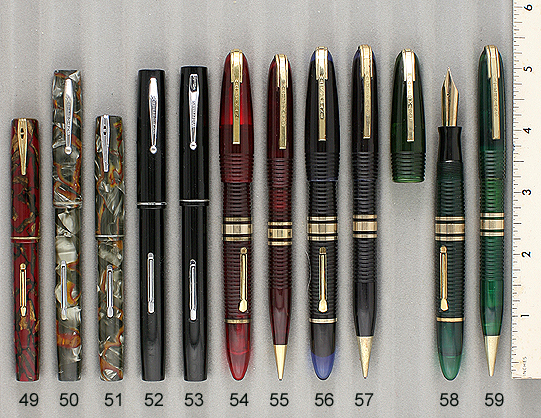 1945 Waterman Twist-activated pencil for above set. 1949 Waterman #2 LF in Golden Pearl. GFT. Medium, flexible nib. Near mint. 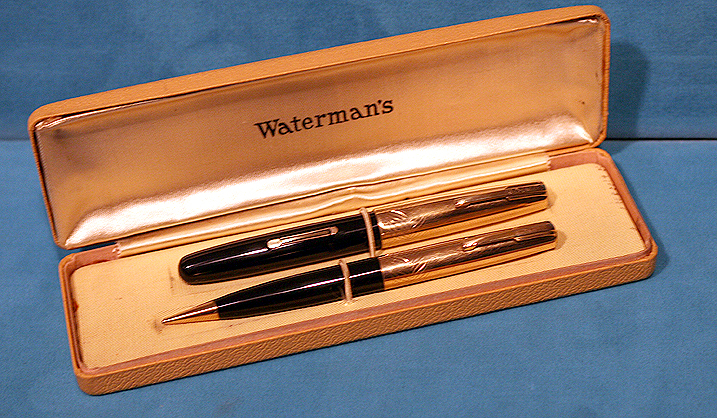 1949 Waterman “Lady Garland” Taperite Set in Black with Gold-plate caps. Caps are decorated with a gold flourish chasing. GFT. Medium nib. New-old-stock. Mint in original box. Click for photo of pen in box. 1949 Waterman Pencil for above set. 1996 Aurora Ipsilon cartridge/converter-fill in Burgundy. GPT. Medium nib. New-old-stock. Mint in original box with outer sleeve, papers & cartridges. Converter included. Click for photo of pen in box. 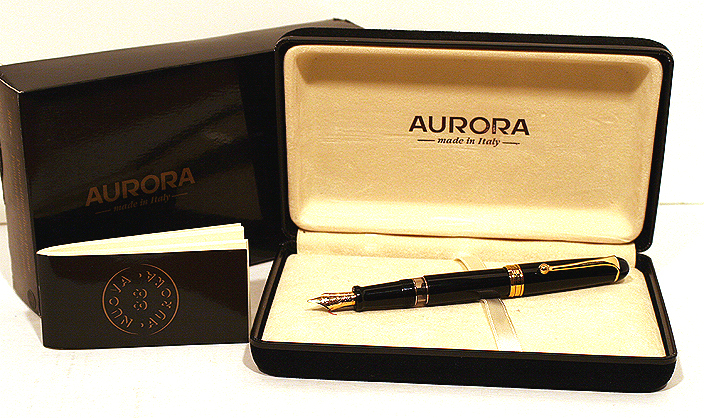 2005 Aurora 88 PIF in Black. GPT. Medium nib. New-old-stock. Mint in original box with outer sleeve and papers. Click for photo of pen in box. 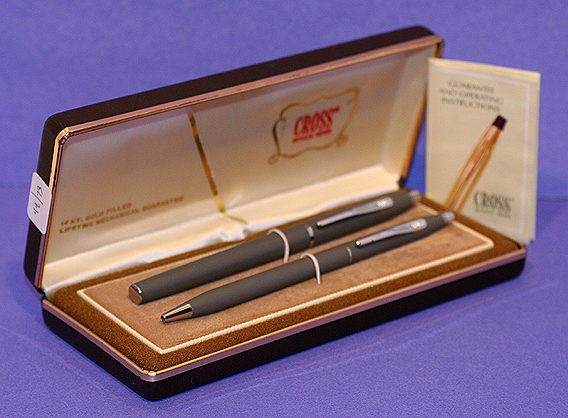 1990 Cross Roller Ball – Ball Pen Set in Grey Matte. New-old-stock. Mint in box with papers. A great Christmas present! Click for photo of pen in box. 1990 Cross Ball Pen for above set. 1988 Montblanc “S” Pen cartridge/converter-fill in brushed Black Stainless Steel. Broad nib. New-old-stock. 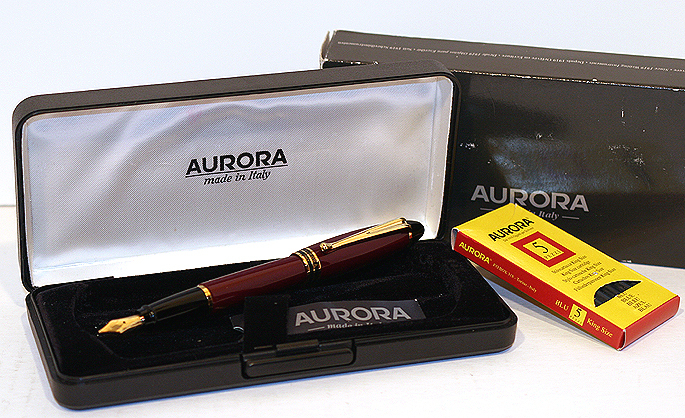 Mint in box with papers, leather sleeve, cartridges, converter. Click for photo of pen in box. 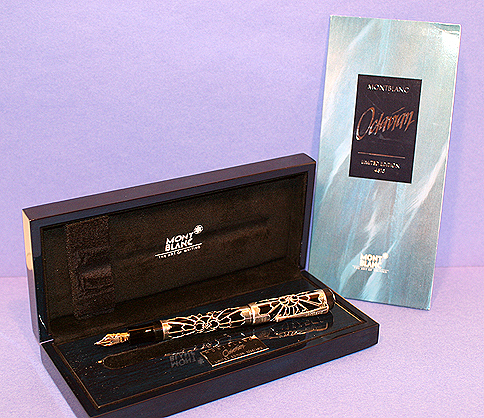 1994 Montblanc Agatha Christie PIF LE #27621/30000, Sterling Silver trim and “Dragon” clip. New-old-stock. Mint in original box, with papers and outer box. 18K broad nib. Click for photo of pen in box. 1995 Montblanc Octavian PIF LE #2809/4810, Sterling Silver “Spider Web” Filigree overlay. New-old-stock. Mint in original box with papers, but no outer box. 18K nib. Click for photo of pen in box. 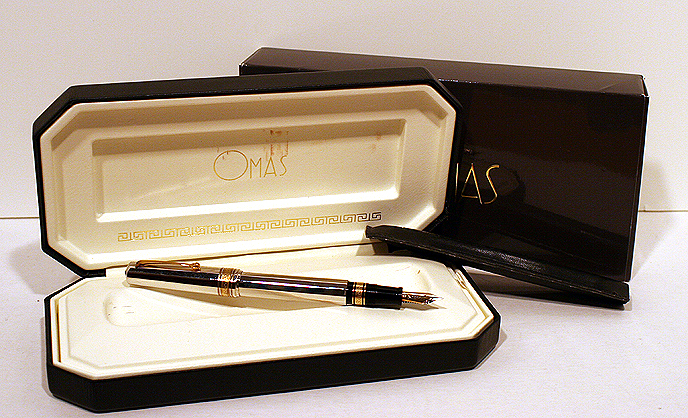 1988 Omas MOMA (Museum of Modern Art) PIF in Black. CPT. Fine point. New-old-stock. Mint in original box with outer box, leather pouch, papers. Click for photo of pen in box. 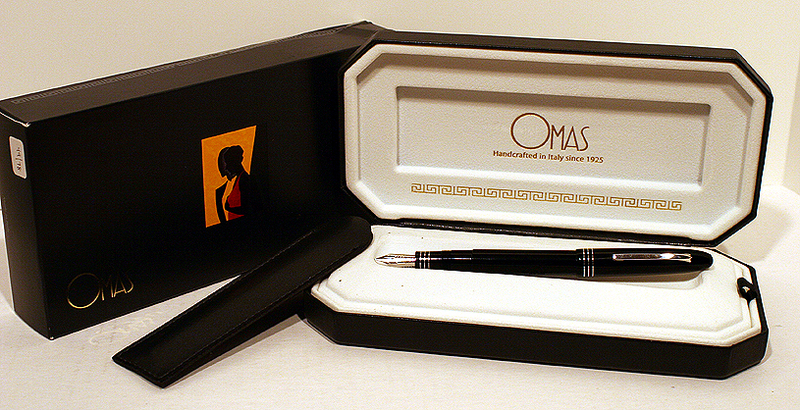 1997 Omas Paragon Dama PIF 12-sided in black. Silver trim. Medium nib. Near mint++ in original box with papers and outer sleeve. Click for photo of pen in box. 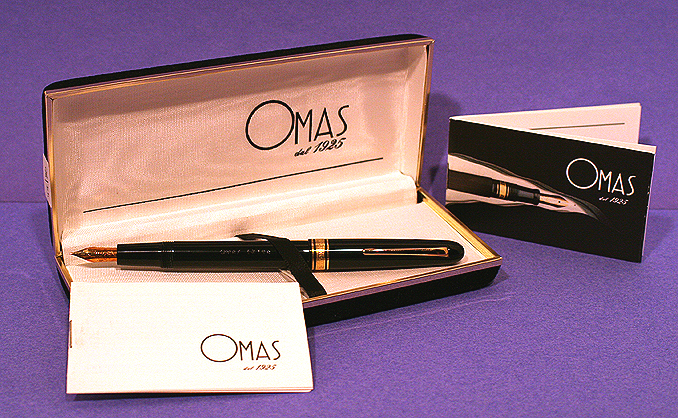 1967 Omas Extra 555/S PIF in Black. GFT. Fine point. New-old-stock. Mint in original box with papers. Click for photo of pen in box. 1983 Omas 502G Collection PIF 12-sided in Sterling Silver. GPT. Medium nib. New-old-stock. Mint in box with outer sleeve, leather pouch, papers. Click for photo of pen in box. 1990 Parker Duofold International cartridge/converter-fill in Marbled Red. GPT. Extra-fine nib. New-old-stock. Mint in original box with outer box and papers. Converter included. Click for photo of pen in box. 2000 Parker Duofold International cartridge/converter-fill in Jasper Red. GPT. Medium nib. New-old-stock. Mint in box with outer box, papers, etc. Converter included. Click for photo of pen in box. 2007 Parker Duofold Centennial “London” LE #82/100 in alternating hoops of white edged and yellow transparent acrylic. Nicknamed the “Bumblebee” by the pen community. Medium, 18K nib. Cartridge/converter-fill New-old-stock. Mint in original box, outer box and outer sleeve, with all papers. Click for photo of pen in box. 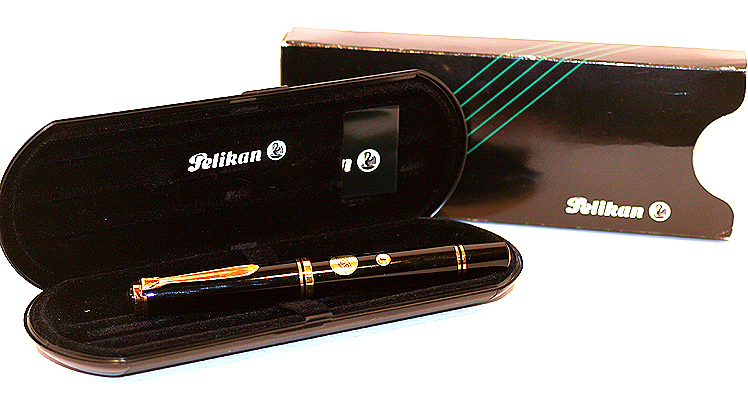 1987 Pelikan M800 PIF in Black. GPT. Early version, made in West Germany, with 18K fine nib. New-old-stock. Mint with original labels, in original box with outer sleeve, papers, etc. Click for photo of pen in box. 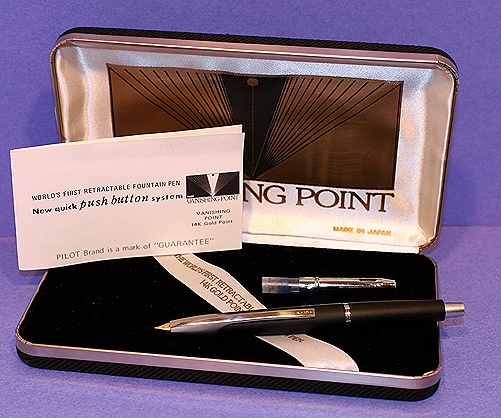 1994 Pilot Vanishing Point cartridge-converter-fill in Matte Black with Stainless Steel trim. Medium nib. Near mint++ in original box with papers. Converter included. Click for photo of pen in box. 1994 Pilot Vanishing Point cartridge/converter-fill in 18-sided Black. Stainless Steel trim. Fine point. New-old-stock. Mint in original box with outer sleeve. Converter included. Click for photo of pen in box. 1990 Sheaffer Imperial Doctor’s 3-piece cartridge/converter-fill Set in White. Fine point. New-old-stock. Mint in original box with papers, cartridges. Converter included. Click for photo of pen in box. 1990 Sheaffer Roller Ball for above set. 1990 Sheaffer Ball Pen for above set. 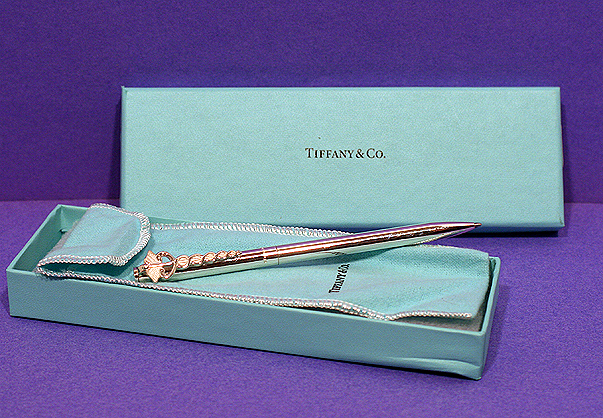 2000 Tiffany “Caduceus” twist-activated ball pen in Sterling Silver. New-old-stock. Mint in original box with flannel pouch. What a great gift for a doctor friend! Click for photo of pen in box. 2006 Visconti Millennian Arc II Crescent-fill LE #809/1000 in Transparent Lucite with Orange swirls. GPT. 18K medium nib. New-old-stock. Mint in “alligator” box with outer box, ink bottle, papers. 2006 Visconti Divine Proportions LE #1195/1618 pump-fill in 5-sided spiral Briarwood celluloid with Sterling Silver trim. 18K fine nib. New-old-stock. 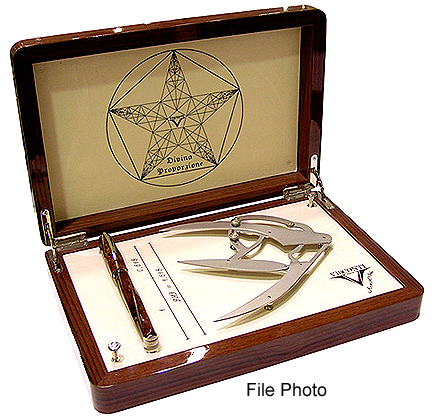 Mint in original box with outer box, papers, etc., including a specialized caliper designed to detect the Divine Proportion (1:1.618) in objects up to 15cm in length. Click for photo of pen in box. 1994 Yard-O-Led “Victorian” cartridge/converter-fill in Sterling Silver Chased (snail) design. 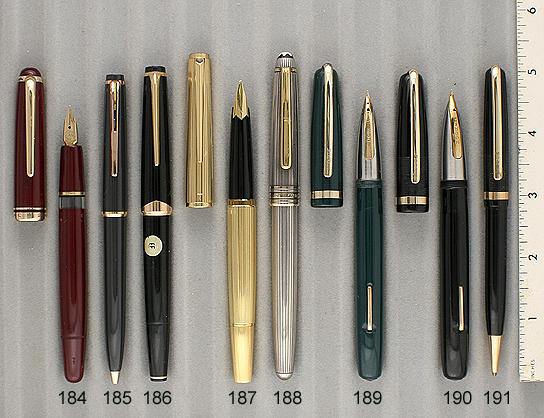 18K medium nib.New-old-stock. Mint in original box with outer box, leather pouch, papers. Click for photo of pen in box. 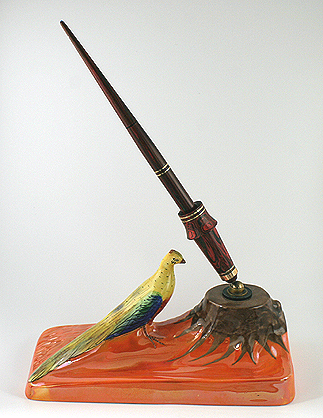 1930 Wahl/ Carltonware #2 size Figural “Bird & Tree Trunk” Carltonware fine ceramic Desk Set with Wahl Woodgrain LF Desk Pen and Trumpet. Very rare! Medium nib. Near mint. 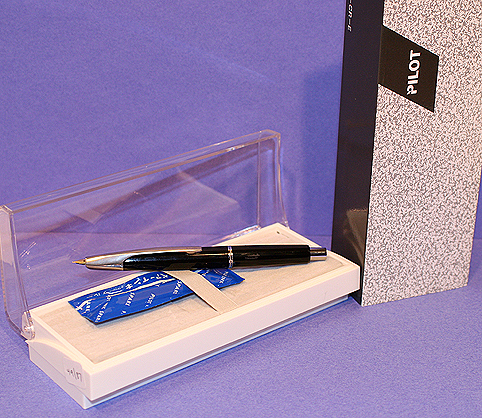 Click for close-up of desk set. 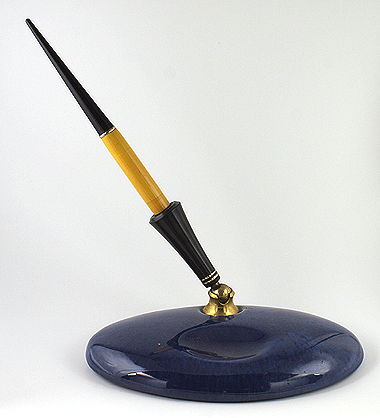 1930 Parker/ Carltonware Duofold Jr. BF In Mandarin Yellow Desk Set in Dark Blue Oval Carltonware Desk Base (with “Parker” decal). Medium nib. No barrel imprint. Excellent. Click for close-up of desk set. 1930 Parker/ Carltonware Depression Era BF In Black with Green Moiré taper Desk Set in Green Oval Carltonware Desk Base (with “Parker” decal). Medium nib with a tad of flex. Near mint. Click for close-up of desk set. 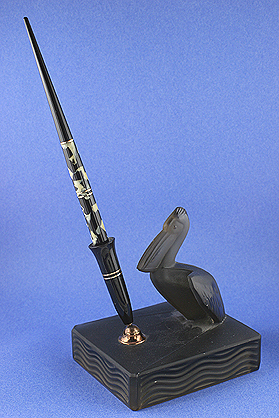 1927 Wahl Eversharp Smoke-Glass Desk Set with large figural Pelican. 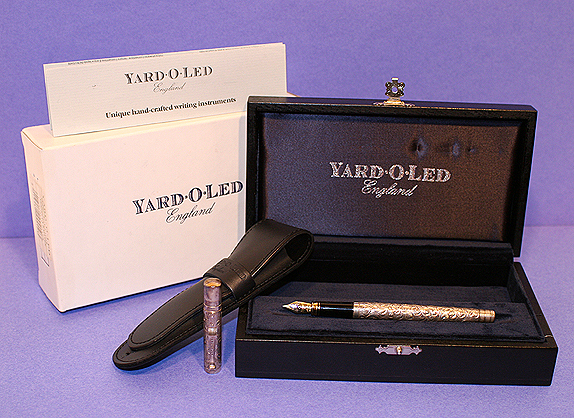 Black pen holder with #2 size LF Black & Pearl desk pen. Medium “Signature” nib. Mint with original label (one corner torn off). Click for close-up of desk set. 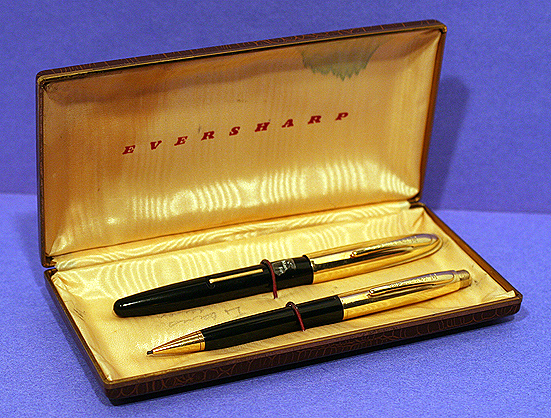 1942 Eversharp Skyline LF Desk pen in Black. Base is 2″ x 3″ marble in Ivory with Golden Swirl. Broad, italic nib. Near mint. Click for close-up of desk set. 1942 Eversharp Skyline LF Desk pen in Black. Base is 2″ x 3″ marble in Onyx Marble. Medium nib with an italic flair. Near mint. Click for close-up of desk set. 1942 Eversharp Skyline LF Desk pen in Black. 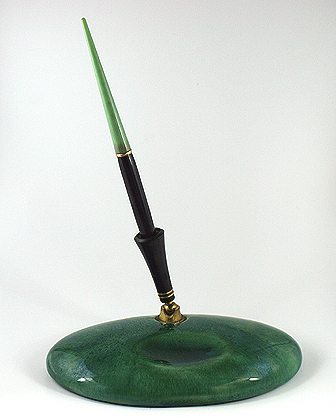 Base is 2″ x 3″ marble in Green Pearl with Golden Swirl. Fine nib.Near mint. Click for close-up of desk set. 1930 W.S. Hicks #2 size bulb-fill Desk Set in Sterling Silver. Very Art Deco 4.25″ round, stepped base. Medium nib. A minor scar here and there, otherwise near mint. Click for close-up of desk set. 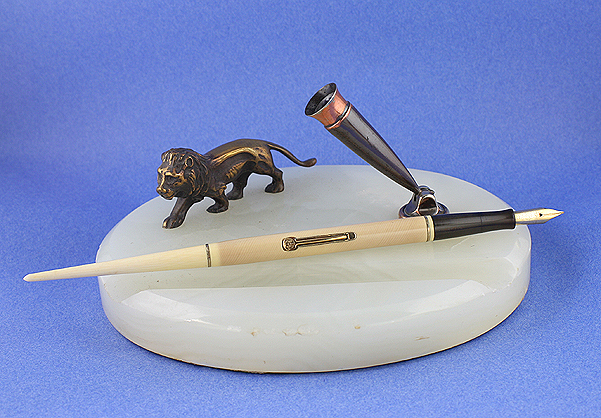 1930 Waterman #2 LF Desk Set in 6″ x 5″ oval white marble, with metal Lion (bronze?) And trumpet. Ivory Waterman desk pen (never seen before). Fine, extra-flexible nib, with an italic flair. Pen barrel has darkened a bit, otherwise near mint. Click for close-up of desk set. 1975 Aurora 88P PIF in Black. Chrome, pinstriped cap, with black enamel “teardrop” inlaid into clip. Slanted derby. Fine point. Visualated barrel. Near mint. 1935 Omas/Minerva “Classica” LF in Green Pearl. GFT. Minerva was an Omas sub-brand. Medium/fine, triple-flexible nib. Near mint. 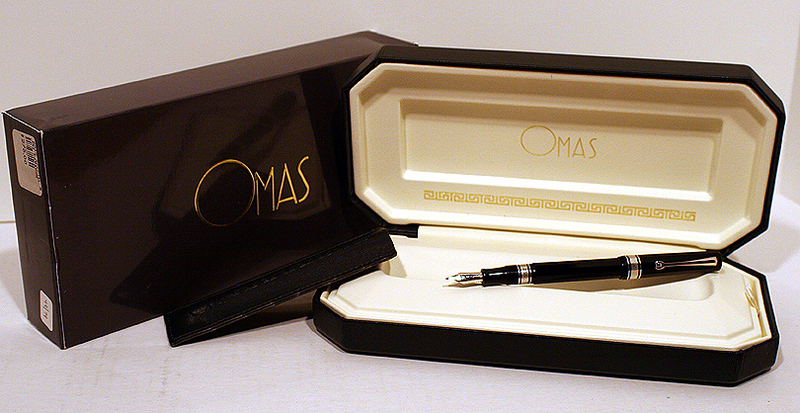 1950 Omas Extra “Ogiva” (round) 557/S PIF in Grey Striped “Platinum” celluloid (rare). Visualated section. Fine, extra-flexible nib. Near mint. 1950 Radius “Superior” BF in Ivory with Black Veins. 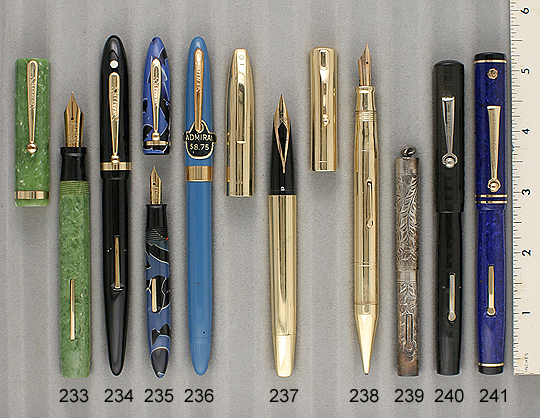 The design was a direct copy of the Sheaffer shape. GFT. “Radius Superior 585″ broad, extra-flexible nib. Some light cap and barrel ambering, otherwise near mint in original box. Click for photo of pen in box. 1959 Sheaffer PFM I Snorkel-fill in Green. NPT. Fine point. Near mint Three available: fine; medium/fine; medium. Please state your choice. 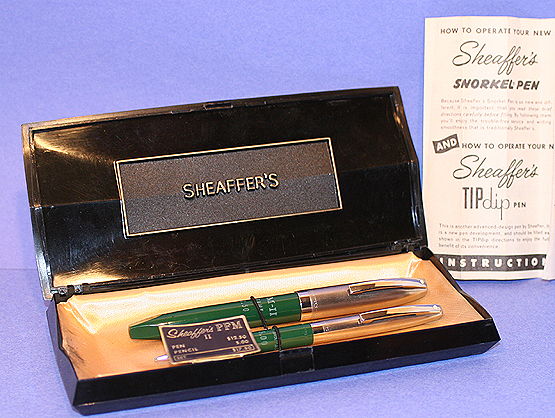 1959 Sheaffer PFM II Snorkel-fill Set in Green with brushed Stainless Steel caps. Medium/fine nib. New-old-stock, mint with original decals, in original box (one hinge broken). Click for photo of pen in box. 1959 Sheaffer Twist-activated pencil for above set. 1959 Sheaffer PFM II Snorkel-fill in Green with brushed Stainless Steel cap. Medium/fine nib. New-old-stock, mint with original decal. 1959 Sheaffer PFM III Snorkel-fill in Green. GFT. New-old-stock. Mint. Three available: fine; medium/fine; medium. Please state your choice. 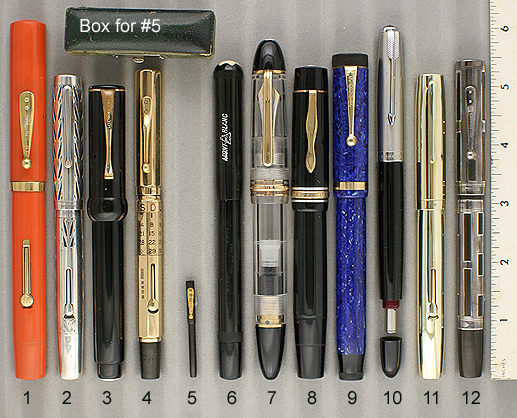 1959 Sheaffer PFM V Snorkel-fillin Green with pinstriped Gold-filled caps. Medium “Ball” nib. New-old-stock. Mint with original decal on fountain pen. 1959 Sheaffer PFM V “Clip activated” ball pen in Green. New-old-stock. Mint. 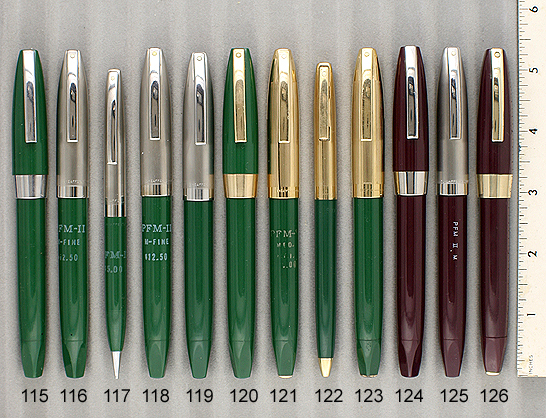 1959 Sheaffer PFM V Snorkel-fill in Green with pinstriped Gold-filled cap. Near mint. Two available: extra-fine; medium “Ball.” Please state your preference. 1959 Sheaffer PFM I Snorkel-fill in Burgundy. NPT. Medium nib. Near mint. 1959 Sheaffer PFM II Snorkel-fill in Burgundy with brushed Stainless Steel cap. Medium “Ball” nib. Mint with original decal. Australian manufacture. 1959 Sheaffer PFM III Snorkel-fill in Burgundy. GFT. Medium nib. New-old-stock. Mint. 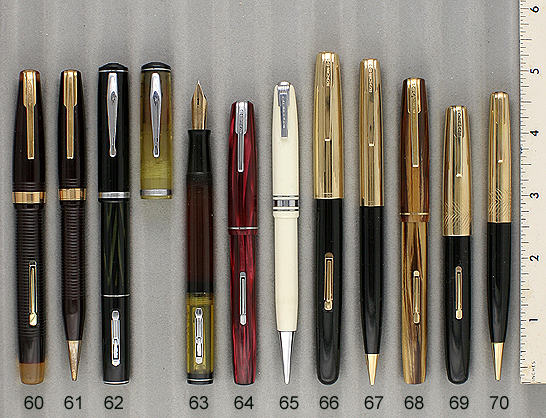 1959 Sheaffer PFM IV Snorkel-fill Set in Burgundy with Polished Chrome caps. Medium/fine nib. New-old-stock. Mint. 1959 Sheaffer “Twist activated” pencil for above set. 1959 Sheaffer “Twist activated" pencil for above set. 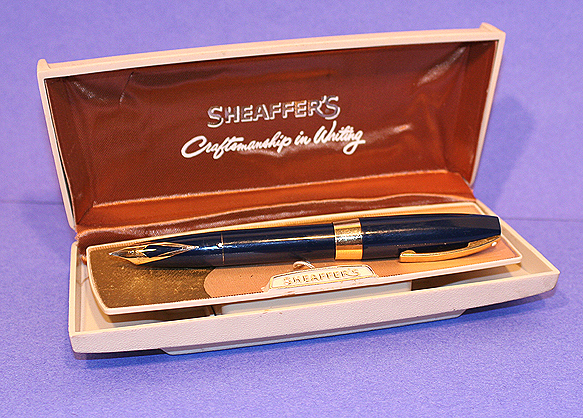 1959 Sheaffer PFM II Snorkel-fill in Blue with brushed Stainless Steel cap. Medium nib. Dipped. Near mint. 1959 Sheaffer PFM III Snorkel-fill in Blue. GFT. Medium/fine nib. Dipped, otherwise new-old-stock, mint in original box. Click for photo of pen in box. 1959 Sheaffer PFM III Snorkel-fill Set in Blue. GFT. Fine nib. Dipped. Near mint. 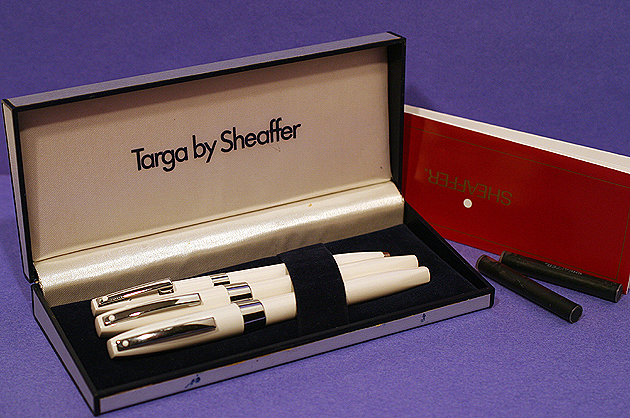 1959 Sheaffer PFM I Snorkel-fill Set in Grey. Rarest color! NPT. Extra-fine. Part of original decal still shows on the pen, and entire decal is still on the pencil. Dipped, otherwise new-old-stock, mint in original box. 1910 Betzler #2 size Side-Button-fill in BCHR. A small button protrudes from the side of the barrel.Push to fill (and try not to accidentally push the button while writing or when the pen is in your pocket!). “Special” medium, extra-flexible nib. Near mint. 1923 Chilton #2 “Pneumatic-fill” in Black Lined Hard Rubber, with Cardinal Hard Rubber insets in both the top and bottom of the pen. To fill, pull the barrel sleeve down about 2.5″. With the nib in ink, press your finger over the hole in the bottom of the barrel, and return the barrel to it’s original position. This depresses the bladder. Releasing your finger allows the air pressure to equalize and the bladder draws up the ink. Medium, extra-flexible nib. Near mint. 1910 Crocker #2 “Blow-filler” in BHR. Yes, you put the end of the barrel in your mouth and blow while the nib is in the ink bottle.That depresses the bladder.When you release, the pen fills.Eventually, Crocker offered a rubber syringe as an option. Medium, extra-flexible nib. Near mint. 1915 Evans #2 size “Hump” fill in Black Lined Hard Rubber. NPT. Wm. Welty patented the “Hump” filler around 1904. Conklin (with their crescent-filler) sued Welty and lost. Patrick Evans than joined Welty to infuse funds into the company, which was then changed to the Evans Fountain Pen Company. Signed fine, flexible “EVANS” 14K” nib. Near mint. 1920 General Manufacturing #2 “Snap-Fill” in Black Lined Hard Rubber. GFT. Came with pin to attach the pen to your shirt or jacket. Extra-long barrel allowed you to hold the pen comfortably with the cap still attached to your shirt. When you lift the lever from barrel a small hinged extension drops from the lever, which is pressed against the pressure bar to fill the pen. Shown “open” in the photo. Some imprint wear (fully readable), otherwise near mint. 1915 A.A Waterman #4 Twist-fill in BCHR. Broad, flexible, italic nib. Accommodation clip. 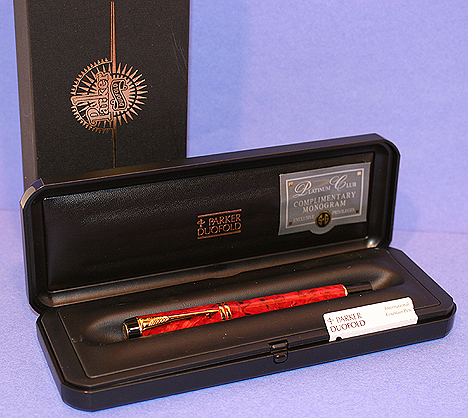 Both the barrel and nib are imprinted “Not connected with the LE Waterman Co.” the result of a law suit L.E won against A.A. Near mint. 1915 A.A. Waterman #7 Twist-fill in Red Mottled Hard Rubber. NP Clip. A large pen in near mint condition! 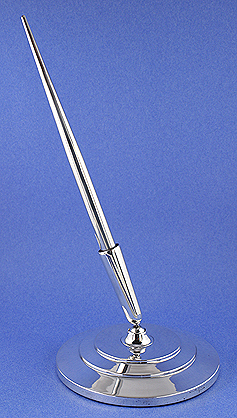 Both the barrel and nib are imprinted “Not connected with the LE Waterman Co.” the result of a law suit L.E won against A.A. Fine, extra-flexible nib. 1928 Carter Model 4117 (#8 size) LF in Black with Red Swirl. Beautiful! Fine, flexible nib. Near mint. 1910 Conklin “P3″ Crescent-fill in Red Mottled Hard Rubber. Very rare! GFT. Medium/fine, extra-flexible nib. Some imprint wear here and there (almost fully readable) and a little oxidation, otherwise near mint. 1924 Conklin #20P Crescent-fill ring-top in BCHR. GFT. Medium, extra-flexible nib. Near mint. 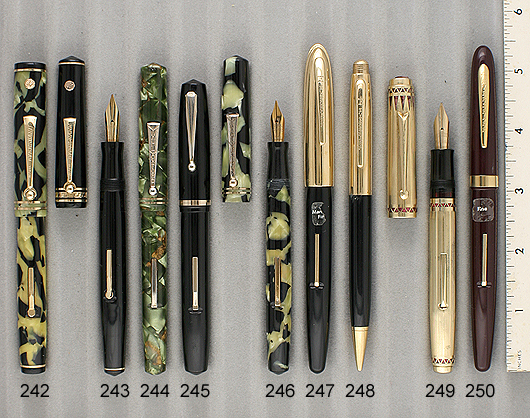 1927 Conklin Endura Standard LF in Black & Bronze. Set off nicely with inlaid yellow bands. GFT. Medium nib. Some surface wear here and there, otherwise near mint. 1927 Conklin Endura Standard LF in Deep Jade. Set off nicely with inlaid red bands. Medium/broad nib. Near mint. 1930 Conklin Endura Symetrik Oversize LF in Jade with Black Veins (large and beautiful!). Perhaps Conklin’s largest pen. GFT. Fine, extra-flexible nib. Perhaps a tad of barrel darkening, otherwise near mint. 1930 Conklin/All American #2 LF in Deep Jade. GFT. Unusual long humped ball clip (similar to Sheaffer). Broad, flexible nib. Near mint. 1932 Conklin Nozac Standard 10-sided PIF in Green Pearl with Black Veins. GFT. “5M” Word Gauge! Fine point. Near mint. 1921 Dunn “Senior” Pump-fill in BCHR. GFT, with red turning knob. Fine point. New-old-stock with original label (a bit threadbare). The smallest amount of oxidation, otherwise mint. 1958 Faber Castell 964 PIF in Black. GFT. Medium, extra-flexible nib. Unusual visualated barrel, made with horizontal bands. New-old-stock. 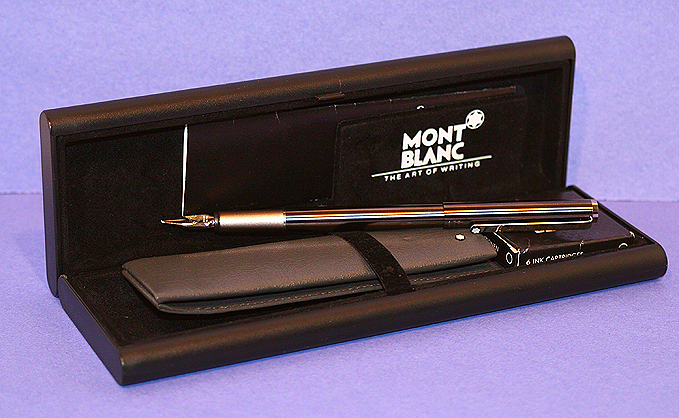 Top-of-the-line model, made at the time to compete with Montblanc’s best pens. Mint with original shop label (reads “58:-“). 1929 Leboeuf #8 LF in Tortoise. Large and beautiful! GFT. Medium nib. Near mint. 1930 Montblanc 30 Masterpiece Push-knob filler in Black. GFT. Medium, extra-flexible nib, with an italic flair. Near mint. 1930 Montblanc 25 Masterpiece Push-knob filler in Black. GFT. Extra-broad nib. Just a tad of barrel imprint wear (fully readable), otherwise near mint. 1933 Montblanc 15 Push-knob filler in Black (rare model). GFT. Broad, flexible, oblique nib. Near mint. 1930 Montblanc 5K Pencil Twist-activated in Black. GFT. Near mint. 1925 Montblanc 372 Pix Repeater Pencil in Black. Rare model with Red Button (meant to be used with red lead). GFT. New -old-stock. Mint with original shop label (reads “14.50″). 1937 Montblanc 221 BF in Black. GFT. Rare model – note the high derby! Medium, flexible nib. Near mint. 1950 Montblanc Pix Repeater Pencil for above set. 1952 Montblanc 642 PIF Set in Black with “Silvexa” (brushed Stainless Steel) cap. GFT. Visualated barrel. Medium, flexible, italic nib. New-old-stock. Absolutely mint, in original box. Click for photo of pen in box. 1952 Montblanc Pix Repeater Pencil for above set. 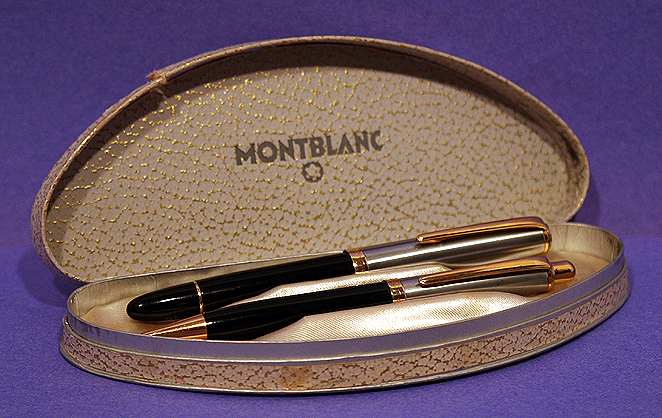 1955 Montblanc 82 Meisterstuck PIF Set in Gold-filled. Alternating pinstriped and plain panels. Broad, oblique nib. New-old-stock. Mint in original box with papers. 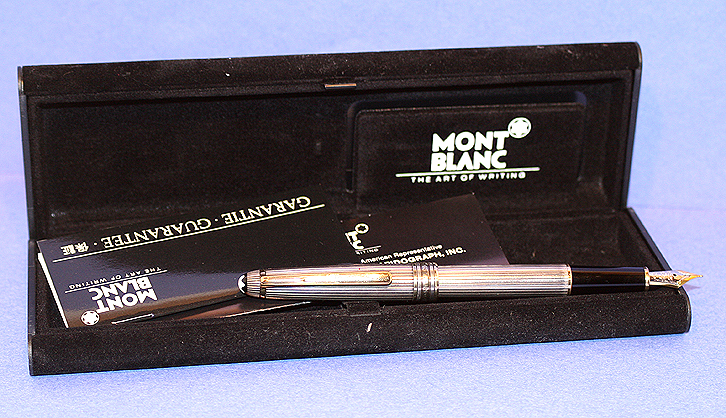 1955 Montblanc “Clip-activated” 88 ball pen for above set. 1959 Montblanc 38 Ball Pen in Dark Grey (rare). This model has the activation lever inset into the center of the clip. GFT. Near mint. 1962 Montblanc 12 PIF in Black. GFT. Visualated barrel. Extra-fine nib. New-old-stock. Mint with original label. 1995 Montblanc 144 Meisterstuck Solitaire cartridge/converter-fill in Sterling Silver pinstriped. GFT. Converter included. Medium/fine nib. A minor surface scratch here and there, visible with a loop, otherwise near mint in box with papers. List $650. Click for photo of pen in box. 1946 Moore Repeater pencil for above set. 1929 Parker Duofold Sr. “Big Red” BF in Cardinal. GFT. Extra-smooth, broad nib. Very close to mint. 1937 Parker Royal Challenger BF in Red Pearl Herringbone. BF. Medium nib. Visualated section. Just the slightest bit of imprint wear on the right edge (fully readable), otherwise near mint. 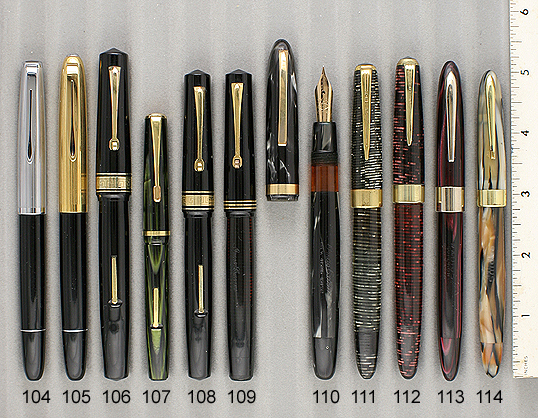 1946 Parker “New Parker Duofold” Aerometric-fill in Burgundy. GFT. Barrel has the Chris Olson Anchor Logo, showing the pen was made in Parker’s Denmark factory. Fine point. New-old-stock. Mint with original label and perfectly clear plyglass bladder. 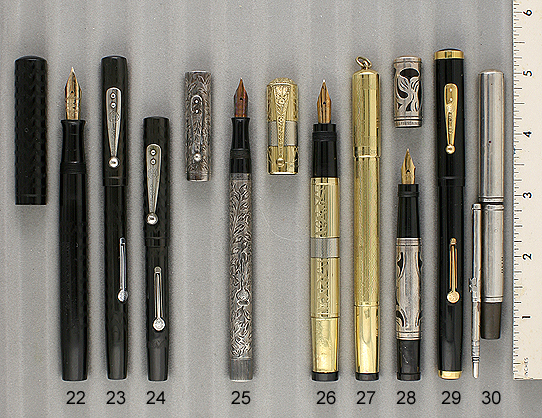 1946 Parker “New Parker Duofold” Aerometric-fill in Black. GFT. Barrel has the Chris Olson Anchor Logo, showing the pen was made in Parker’s Denmark factory. Medium point. Has been filled, otherwise near mint+. 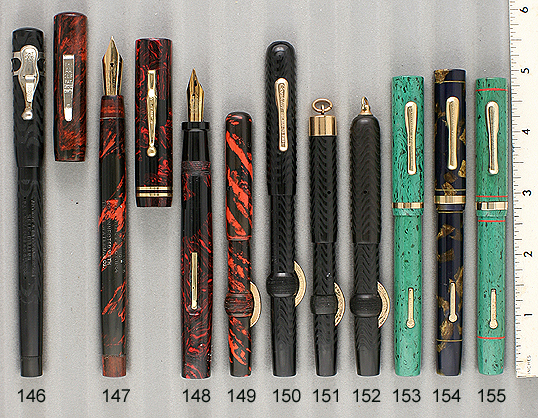 1952 Parker Duofold Aerometric-fill in Red. Fine point. New-old-stock. Mint with decal still on barrel. 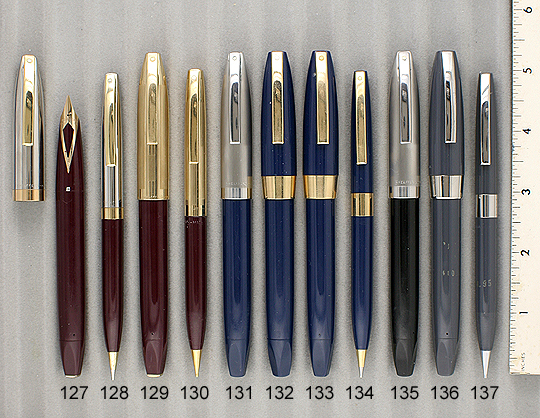 1941 Parker Duofold Aerometric-fill in Dark Blue. GFT. Double-broad nib! Near mint. 1945 Parker Slimfold Aerometric-fill in Black. GFT. Near mint+. 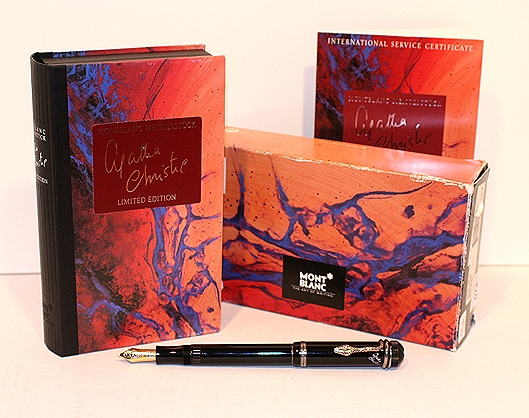 Two available: medium/fine, flexible nib; Medium nib. Please state your preference. 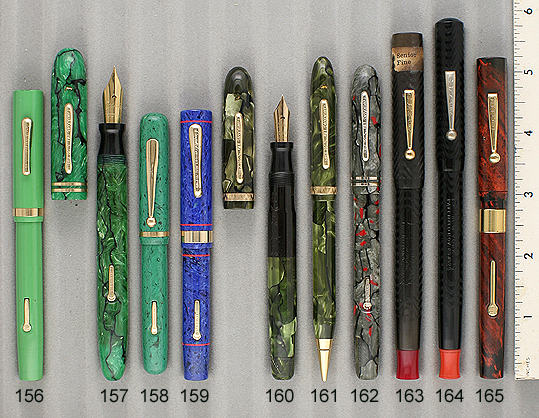 1937 Parker Sr. Maxima Deluxe Vacumatic in Green Laminated. Rare model with a 5/16″ wide hallmarked 9K smooth cap band, signed “PPCo.” Matching jewels. Two-toned, medium/broad nib, which even has a tad of flex!The tiniest bit of wear to the right side of the barrel imprint, but still fully readable, otherwise near mint. No date code – not missing, never had one. 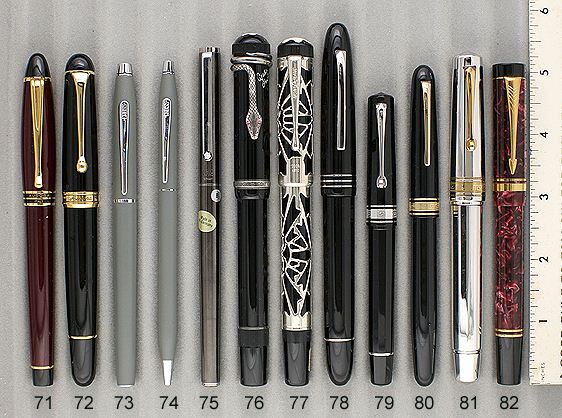 1949 Parker Vacumatic Standard in Silver Laminated. NPT. Two-toned, medium/broad, italic nib, with a tad of flex (rare nib). Excellent barrel transparency. Two minor crimps in each of the two bottom cap bands, otherwise near mint. 1942 Pelikan 100 PIF in Green Pearl. GFT. Medium, extra-flexible nib. Near mint+ in custom made, form-fitted wooden (looks like cherry) box. See close-up photos. 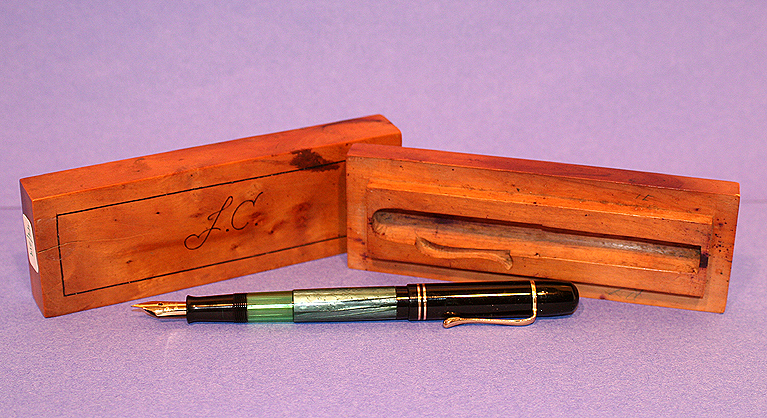 Box cover engraved: “J.C.” Click for photo of pen in box. 1950 Pelikan 400 PIF in Green Striped. GFT. Rare signed Pelikan “DEF” nib (stiff, extra-fine). Near mint. 1950 Pelikan 400 PIF in Black. Rare color. GFT. Medium nib. Near mint. 1951 Pelikan 550 PIF in Brown Striped. GF pinstriped cap and turning knob. Near mint. Medium nib, with a tad of flex. Near mint. 1952 Pelikan 140 PIF in Green Striped. GFT. Rare signed Pelikan “DEF” nib (stiff, extra-fine), this one with the rarer second vent hole! Near mint. 1973 Pelikan 400NN Merz & Krell PIF in Bronze Pearl Striped. GFT. Rare model, with no step at the intersection of the barrel and turning knob. Medium nib. Near mint. 1925 Sheaffer Large Pencil in Jade. GFT. Very unusual to find with no brassing at all, nor any dents or dings to the derby! Mint. 1925 Sheaffer Lifetime Flat-top LF in Jade. GFT. Medium nib. Mint (except for a tad of clip ball brassing), with original label on the bottom of the barrel (almost impossible to read – but it’s there!). 1954 Sheaffer Admiral Snorkel Touchdown-fill in Blue. GFT. New-old-stock, mint with original labels. Medium nib. 1964 Sheaffer Imperial Masterpiece Touchdown-fill in 14K Solid Gold. Alternating pinstriped and plain panels. Medium/fine nib. 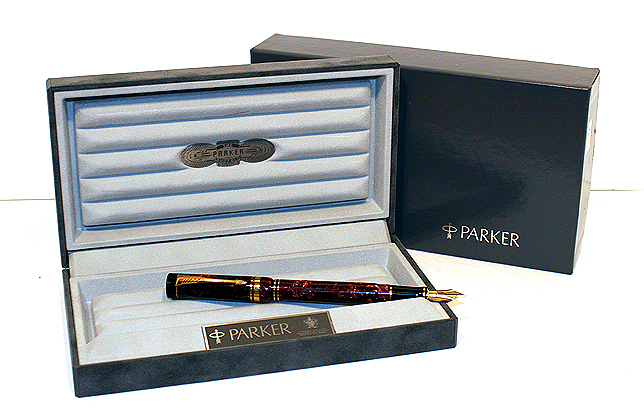 A wonderful pen, with Sheaffer’s diamond shaped inlaid nib. A few minor pinpoint dings and surface scratches to the turning knob, otherwise near mint. 1927 Wahl Eversharp #6 size Gold Seal Personal Point LF in Lapis. GFT. Medium, flexible nib. A tad of lever brassing, otherwise near mint. 1927 Wahl Eversharp #6 size Gold Seal Personal Point LF in Black & Pearl. GFT. Medium, flexible nib, with an italic flair. A tad of lever brassing, otherwise near mint. 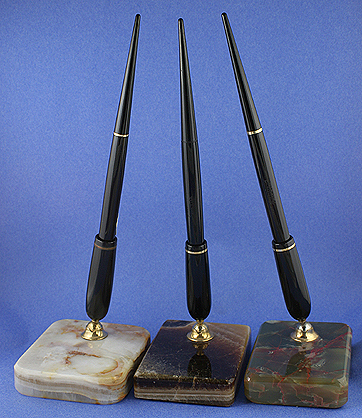 1930 Wahl Eversharp Equipoised Gold Seal Personal Point LF in Black. Rare! Medium/fine, flexible nib, with an italic flair. Near mint. 1936 Wahl Eversharp Oxford LF in Green & Bronze. GFT.Equipoised shape. Broad, flexible, italic nib. Near mint. 1936 Wahl Eversharp Oxford LF in Black. Equipoised shape. GFT. Odd barrel imprint is horizontal rather than vertical. One cap band (every other Oxford I have had were fitted with two cap bands). Medium nib. Near mint. 1936 Wahl Eversharp Oxford LF in Black & Pearl. Equipoised shape. Medium, flexible nib. Near mint. 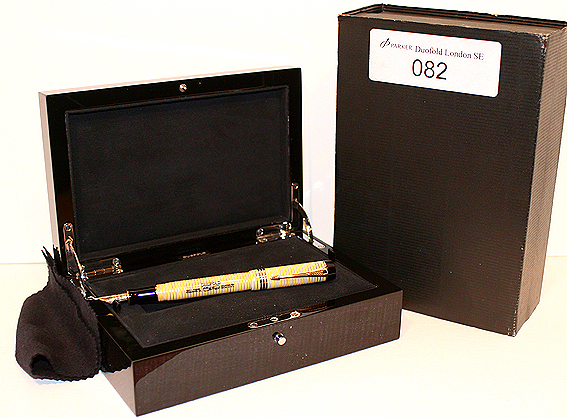 1949 Wahl Eversharp Symphony Deluxe LF Set in Black. 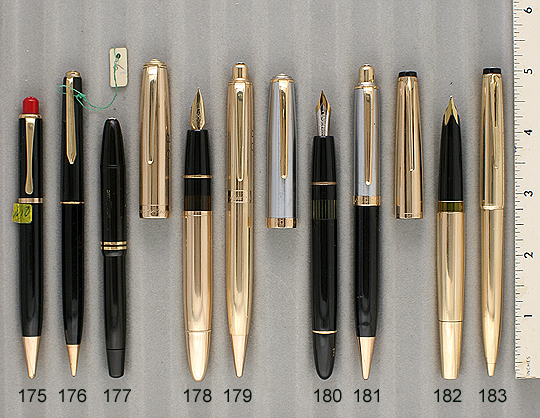 Gold-filled smooth caps with “Wing.” Designed by Raymond Loewy. Fine point. New-old-stock. Mint with original label in box. Click for photo of pen in box. 1949 Wahl Eversharp Twist-activated pencil for above set. 1936 Wahl Eversharp Coronet LF in Gold-filled pinstriped. Red inserts at top and bottom of cap. Extra-smooth, medium, flexible nib. Automatic shut-off valve in section. No dents, dings or brassing! Near mint. 1949 Wahl Eversharp Symphony LF in Burgundy. GFT. Fine nib. New-old-stock. Mint with original label.